NatWest T20 Blast: 5 things that occurred to me in Week 1. As a novice T20 wannabee-lover, a certain number of thing occurred to me after watching the first round of matches on Friday and Saturday. 1) This T20 malarkey can be rather exciting - I must admit that the experience of getting home on a Friday night after a long and stressful week at work and then settling down to watch some fun and exciting (nearly) cricket was actually rather enjoyable, and the size of some of the crowds at some of the games would suggest that they agree too. 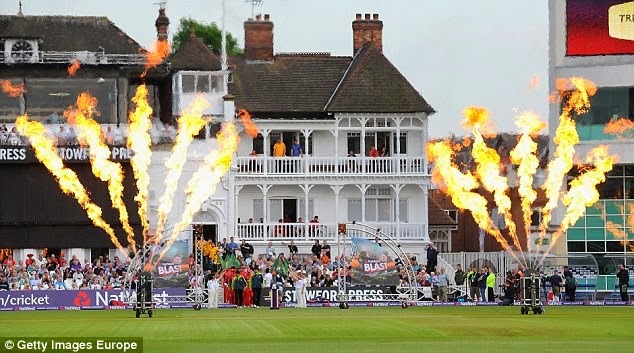 The first televised match saw a crowd of 11,000 at Nottinghamshire's opening match of the 2014 and the crowd of 5,417 at Headingley was an improvement on the clubs own attendances for the majority of their home T20 matches last season. The viewing figures so for the television coverage also seem to be on the healthy side of things if early reports are to be believed. So at first glance it would seem that the ECB's rebranding of the competition may have got off to a good start in terms of viewing figures. However, let's not get too carried away as yet because I noticed that for some reason, the crowds in the midlands and south seem to be larger than in the North of the country - and I'm not really sure why. While the bumper crowds at Notts etc were clear to see, the opening attendance, for example, of 2,633 for Durham's game against the rebranded Worcestershire Rapids may be a concern. Maybe it is a case that those southern softies seem to prefer the lights and razzmatazz of the T20 format more than we do in the North. I'm not sure. 2) If I see one more 'Flintoff to come out of retirement' story I may well choke on my Corn Flakes - Don't get me wrong, I loved Freddie as a player. He was charismatic and great box office in his time as an England all-rounder and of course he was a fine player, though not as great a player as many would have you think. We (and I include myself in this) have been guilty in the past of including Freddie as one of the all-time greats in our ever-lasting search for the next great white all-rounder hope after the 1980's exploits a certain Mr Botham. In actuality, Freddie's figures were never that earth shattering with a batting average in Tests of 31.77 actually being lower than his bowling average of 32.78. His averages in ODI's were admittedly better with a batting average of 32.01 far exceeding his 24.38 bowling figures. While he could occasionally turn matches on their head, he was more often than not, simply inconsistent. However, what cannot be denied is that he was a genuine talisman as a man and player and on more than one occasion was responsible for the occasional match changing and match winning performance. I will never forget that run-out at the Oval in 2009, when in the fading twilight of his career he ran out Ricky Ponting just the Aussies were seemingly cruising through the Test Match. I was watching that moment on TV and that feeling of joy for the game (and the man) that I felt right in that very minute of time will stay with me until the end of my time. And therein lies the rub. The man has a ruined knee, a shot to pieces ankle and a face that was at the receiving end of a misjudged foray into boxing recently. Yes, his return to Lancashire will mean ticket sales and big box office and I would never begrudge him or the club a chance to benefit from a brief return as part of the T20 competition. I simply do not want his cricketing reputation and legacy sullied and demeaned by an ill-judged attempt to regain previous glories. We'll always have the Oval in 2009, Andrew. Let's leave it at that. 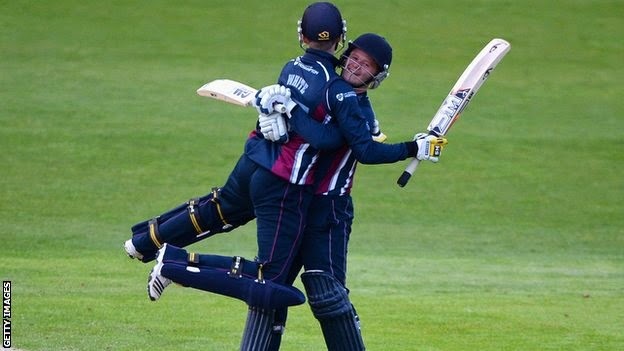 Graeme White (left) and Ben Duckett celebrate their win over Yorkshire - Gits. 3) Watching Yorkshire isn't going to be easy - and that's not just because Headingley doesn't have floodlights. So far this season, it's been something of a roller coaster when watching the Tykes (or whatever the hell their current rebranding is). One minute the boys are coasting to the top of the first division of the County Championship, the next they are on the receiving end of the third-highest successful run chase in County Championship history when Chris Rogers (when will these Aussies stop kicking me when I'm down?!) helped himself to 241 at Lord's a couple of weeks ago in his innings that formed the bedrock of Middlesex's pursuit of 472 against the Yorkie boys. I had just about recovered from that and was agog with excitement (well, quite looking forward) to our first game in the 'Blast' against Northants at Headingley on Friday. It had all started so well with the boys making a respectable 162-7 in the 20 overs - thanks mainly to Liam Plunkett (36) and Tim Bresnan (34) enabling a competitive score to be posted. Even when Northants hit 45 from their first five overs they then started losing wickets and the match looked to be ours when Matthew Spriegel was run out by the redoubtable Ryan Sidebottom which meant that Northants needed nine from the final four balls. However......rather annoyingly the Northants wicketkepper, Ben Duckett sealed with the win for the visitors with just one ball left. The fact that Duckett has been a shining light of the England Under-19s was only a slight consolation, his unbeaten 39 from 29 balls was pretty special- that boy may go far. 4) There's a limit to the re-branding and re-launching of cricket in England - Or rather, should there be a limit? I really don't mind the music, the lights and the fireworks. As a matter of fact I quite like it, It really works for the T20 format and as long as it stays there then I'll be happy. 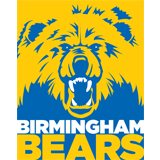 However, Warwickshire's decision before the competition began to rebrand the club 'Birmingham Bears' isn't one that some are too comfortable with. I've seen reports of some within and outside the club citing it as the slippery road to IPL or Big Bash type city franchises and bemoaning the loss of tradition etc etc. I can understand their dislike of name changing, I'm as much a lover of cricketing tradition as the next person. However, I can understand why they have done it, to be honest. There was a feeling by some within the club that the organisation itself (like some others that shall remain nameless) has something of an outdated and stuffy image, particularly amongst the population of Birmingham. As a consequence there has been a strong feeling that it was losing out on attracting sections of the local community that felt excluded from the outset from the club's infrastructure and youth development. I personally think that Warwickshire, sorry, the Birmingham Bears, should be applauded for making an attempt to change it's image in an effort to attract local interest. It is not an attempt to please the overlords at Sky television, it is a genuine attempt to engage the local population. I must admit though, I never knew we had Bears wandering around the Midlands - who knew? 5) I'm Pants at this Fantasy team thing - once again. While it may be too early to judge just how much my latest attempts at forging a winning fantasy team in ANY sport is going, it seams that once again my latest picks have been less than successful. The team I picked for Switch-hit.com is just one of two teams in one of the leagues I'm in - and I believe that I'm currently second. That's right, I'm currently losing in a league of two. I can't bring myself to look at the other league my team is in where there are a much higher number of teams. I fear the worst. It kooks like tomorrow I will be doing some serious trading. I'm not a man who believes in fate or strange coincidences. You know what I'm talking about; the "Oh wow, I was just humming that song just before it was played on the radio", or the classic, "Oh its completely spooky that you rang me right now, I was just thinking about you". There is nothing fatalistic, spooky and absolutely no element of psychic phenomenon going on here. It's all just straightforward probability. The fact is that for every thought, decision and action that we take in this wonderful crazy mixed up world, there are an almost endless amount of consequences that could take place. Our day-to-day minds are cluttered with thousands of thoughts and musings each day and some are bound to connect in some way to another thought or another action. In essence, It is all just random chaos, and I like that. However, many people don't like the idea that life could just be the result of endless coincidences which are actually numerically highly likely to take place at some point in someones day. Many people need to believe that in certainly, we don't often like probability and we certainly don't like things that are unexplained. There is is a term for it - Apophenia , which is tendency to see patterns everywhere, even in random data. We demand, often unconsciously, an explanation (be it spiritual or conspiratorial), when in fact the explanation is that statistically, any particular occurrence - the chance meeting of an old friends only recently after thinking about that person, for example, was bound to happen eventually. However, even that particular view of mine was put to the test the other day when I was contacted by the founder of a company called Switch-Hit. He informed me that Switch-Hit was fantasy sports platform developed by a team with academic backgrounds from University of Oxford, University of California - Berkeley, Georgia Tech & Indian Institute of Technology. I don't know if I was supposed to be impressed by all that - but, er, I was. Now before I go any further, for anyone who doesn't know me or has never read my blog ( and why the bloody hell haven't you??!! ), Well bowled, Harold. An England Cricket Blog there is one thing that you need to understand. I love Test cricket, I can just about put up with the one day games, but have never, and I mean never, have had any love for the T20 format. I won't bore you now with the reasons why- if you wish to pass an hour or two of reading rant fuelled musings on my views then read some past posts from my blog. However, recently i have been re-thinking my attitude. In fact, only one night earlier this week I was lying in my bed and thinking about Cricket. Now don't misunderstand me, I know I'm a little sad and have little life outside blogging. I often think of of many other things (some of them definitely unprintable) while I'm in bed. However on this occasion, I wondering if I should finally try to embrace the admittedly universally more popular of all the games formats. I still love Test Cricket and will always regard it as the truest and best form of the game. However, as I lay in bed I realised that the only way for the Test format to continue against a backdrop of falling attendances is for all of us embrace ALL formats of the game. For too long in recent years have the Test aficionados (like myself) looked down upon the other formats - the true fact is that we all need each other to survive. So I made it my promise to try and at least follow and enjoy the English domestic competition,NatWest T20 Blast, that takes place this summer. I think I then rather quickly fell asleep and snored the night away after the wine finally took affect. Anyhoo, back to the email from Switch-Hit. The message went on to say that they are building the world's first social fantasy sports platform for cricket and having hosted IPL & WC T20, they are now ready for NatWest T20 Blast.......and guess what, yes, that's it - for some reason they thought that I might be able to contribute in some sort of meaningful way. What a coincidence!! - or not, depending on which way you look at it. And you know what - I was interested, no matter that I was something of a novice in trying to enjoy T20......CANT WAIT! 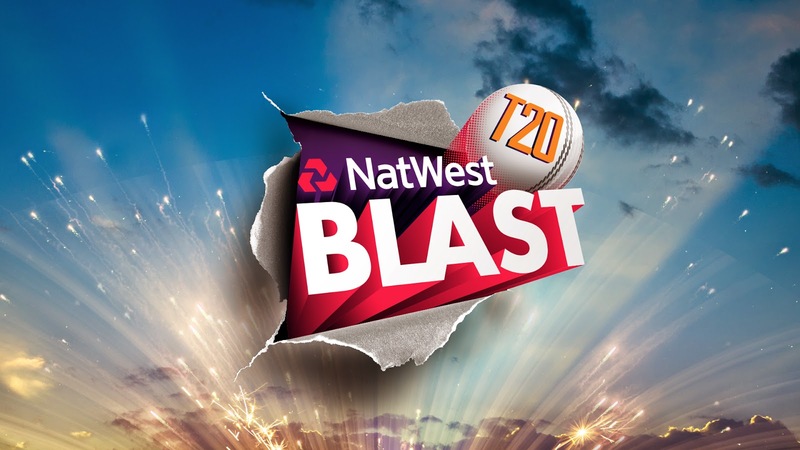 So, for the un-initiated, what is the NatWest T20 Blast.? Well until last year it was known as the Friends life T20 competition and is the attempt by the domestic powers that be to revamp the domestic competition after a series of false starts. The competition sees 18 clubs, initially split into two divisions (north and south) for the first group stages. The top four teams in each league progress to the Quarter-Finals stage to play for a place in the first ever NatWest T20 Blast Finals Day at Edgbaston in August 2014. I think it is time that people like myself give the format, and particularly this home English competition, a proper chance to shine. This could well be the opportunity for the ECB to produce a genuinely innovative competition while while still retaining some semblance of cricketing tradition. There are none of the nonsense auction shenanigans of the IPL where money and the highest bidders are running (or arguably, ruining) the game. The fact that the signing of oversees players are limited in the NatWest T20 Blast means that Counties will be represented by a mixture of loyal home-grown players who are richly complimented by sombre truly exciting foreign players. The fact that most of the games take place on a Friday night (at least 87 of the 126 group stage matches) means that this English summer might be one to remember. I genuinely and sincerely look forward to watching and writing about it. So,with each team being able to field no more than two overseas players the teams have been making most of their limited opportunities with a number of notable signings. I thought I'd leave you for now with a list of five that I'm personally looking forward to see play. 1) Perhaps the most exciting (from a Yorkshireman's point of view) was the high profile signing of 'Mr. 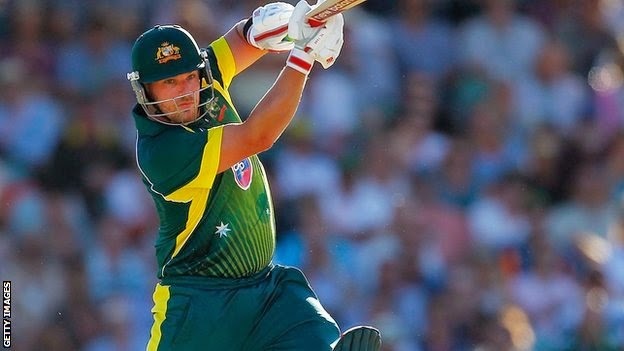 Lets take the English attack to the cleaners' - Aaron Finch. The opening batsman, currently ranked as the world’s third best T20 batsman, was partly responsible for continuing the calamity down under during our Winter tour of Australia. However, now that he is playing for Yorkshire I obviously forgive any of those past playing discretions against Captain cook's brave boys and now I love the man. Well that is, until the end of the English summer. 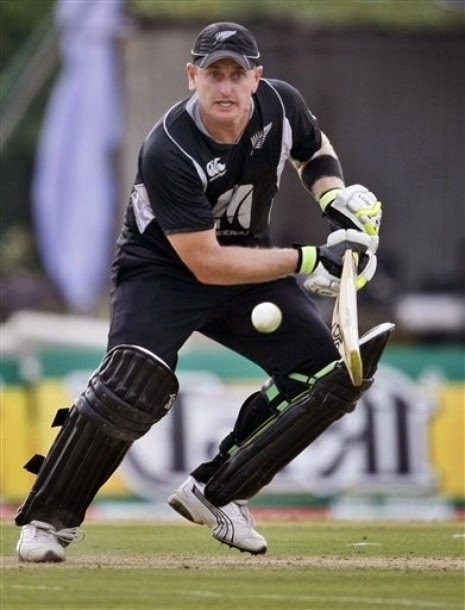 2) He may be 38 years old but the signing by Leicestershire of New Zealander Scott Styris is still an exciting one. It only seems like a couple of years ago when he grabbed the headlines by smashing a century off just 37 deliveries against Gloucestershire, well actually it was just a couple of years ago. Styris has so far amassed nearly 4000 runs in the T20 format alone - not bad at all. 3) The on-off signing of Saeed Ajmal seems to have finally become a done deal and it's one that should see Worcestershire benefiting from the off-spinner's genius. His 63 T20 wickets are itself pretty special, but when you also take into account his 182 ODI wickets and, most importantly of course, his 169 Test Wickets....well you have one very special player. 4) Due to Saeed Ajmal's commitment to the Caribbean Premier league, he will be replaced part-way through the competition by another high-profile New Zealander, Mitchell McClenaghan. McClenaghan has played a large part in the recent resurgence of the Kiwi's in the limited over formats, particularly in the recent T20 World cup where he achieved figures of 1-22 against England (we were rubbish again), 1-29 against the Netherlands and also a couple of wickets against Sri Lanka. If becoming interested in T20 wasn't enough for me then today there was another 1st for me, for today I form my first ever fantasy cricket team. Switch-Hit are hosting the NatWest T20 Blast Fantasy Cricket on www.switch-hit.com. 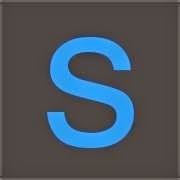 On the site you can build your team and challenge your friends and possibly lose them. Yes, it can get competitive and taxing especially with an in-built sledge tool. A place where you can vent your anger, sledge and disorient your opponent and win a psychological battle. Or you could simply join the league that I've just created for the NatWest T20 Blast on www.Switch-Hit.com. My league is called Well Bowled, Harold and my (winning) team is called ThiswilldountiltheTests. Feel free to join me and come second! Stainland Cricket club - folding after 130 years of history. This week a good friend of mine,Trish Wood (yes I do have friends, be quiet), included me in a Facebook group that had recently been formed in response to the closure of a local Cricket from my hometown of Halifax in Yorkshire. Now for various reasons that my overworked legal team cannot go into, I'm not allowed to say why I left the area in order to move up here to Scotland some years ago. Suffice to say, the restraining orders etc are due to expire soon, which is a good thing as I was planning to sneak back across the border for a brief visit in July - but shhhh, don't mention that to anyone. Anyhoo, the redoubtable Mrs Wood suggested that I use my blog to help in whatever little way I can to publicise the anger of the demise of the cricket club and the plans by herself and others to reclaim something from the ashes of what is a genuinely sad situation. That, I can try to do. However the suggestion that " if you can share your cricket blog on here as a bit of light relief I'm sure you'll rack up a few new readers" may well be problematic; for one thing, any offer of me providing light relief could be another problem that could send my legal team into more overworked stress, and secondly, I'm not too sure if there are that many people out there that want to listen to me prattle on talk about god's own game. Oh, well, I'll try anything once (easy, legal team, easy). The organisation in question is Stainland Cricket Club. Stainland’s first team finished sixth in the bottom division last season and their seconds came seventh in the parallel division, however they have been unable to raise a second team for their first two matches of the season in Division Two. Consequently the Club secretary Kevin Hutchinson met members of the league’s executive and advised that having reviewed their playing resources, they the league that they were unlikely to be able to raise a second team at all this year. The Stainland committee then had a meeting of their own and a decision was made to dissolve the club, so ending over a century and a quarter of existence. The club were prolific winners of the Parish Cup in the early 20th century, lifting the trophy in 1901, 1908, 1922, 1933 and 1935. As recently as 2002 they were Halifax league first XI second division 2 champions. However that only tells part of the story, because while success has been scarce in recent years, not only was the club in existence for going on 130 years, but were also founder members way back in 1914 of the Halifax Cricket League. Not only that, but Cricket clubs such as this, like hundreds of others across the land, all come with their collection of legends. Whether they were players, members, or those who came simply to watch the cricket, each and every club has them. Stainland's was Len Norcliffe, who sadly passed away relatively recently. If there ever was a heartbeat of a club, from what I can gather, it was him. Frankly it is heartbreaking that while at world level the T20 nonsense and the abomination that is the IPL goes from financial strength to strength, clubs like Stainland, which for generations have been the soul and heartbeat of an English community, are left to wither and drift into closure. "In many ways it is the archetypal village cricket venue: a low, semi-whitewashed dry stone wall at one end, a herd of cows wandering aimlessly in a large adjacent field, and vast swathes of farmland for almost as far as the eye can see. Almost all the benches round the ground's perimeter are dedicated to friends and followers of the team. Stainland CC was established in 1884. For the best part of 40 years, they played at Drury Lane - a venue famous for its bandstand. 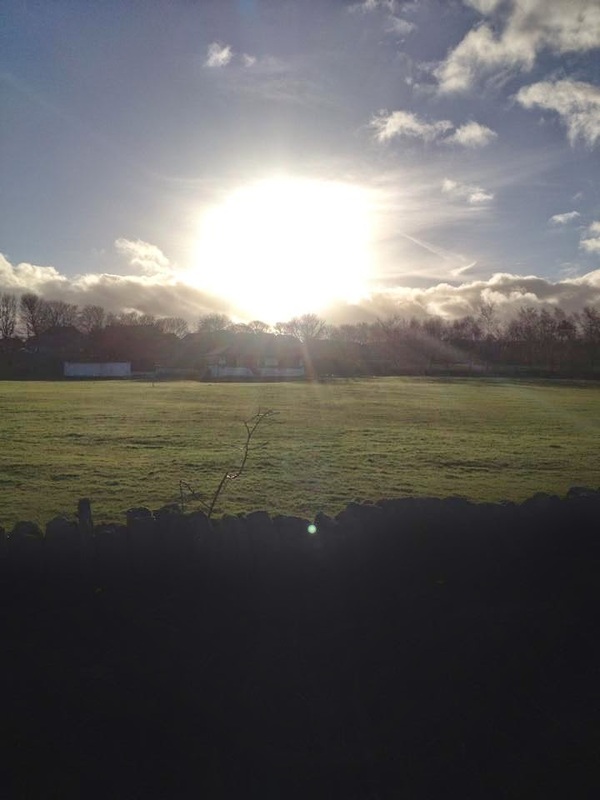 In 1922, the club received their current ground, on Stainland Road, as a post-war gift. The working men of the village had a new recreation area, and the folk at the British Legion were named as trustees. 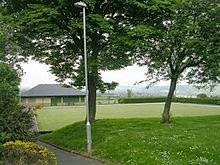 The Memorial Ground, a peaceful, semi-rural setting, now boasts a spanking new beige-and-green pavilion (which is also utilised by the hardworking bowls players when they are in action). In the end, the cricket club decided to go it alone, and by May 2001 a permanent building had been erected and officially opened. " The last part of that selection of cricketing history says everything about financial help from local authorities, therein lies the rub. Many local authorities seem happy just to let situations like this run their inevitable course whilst being happy to take the rent and other financial benefits of ownership, whilst doing little to further the financial interests of the institutions that have fed the community for generations. The ground is owned and controlled by Calderdale Council, cricket looks likely to continue there with Barkisland juniors, Huddersfield College and academy sides from the Cricket Asylum in Sowerby Bridge currently staging matches there. But Stainland have folded and that is a crime. 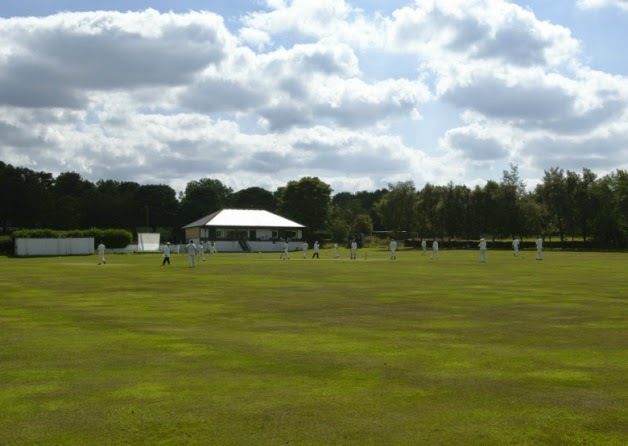 A facebook group has been set up in the hope that, whilst running a league team from Stainland may not be possible in the foreseeable future, at the very least a youth team could emerge from the ashes of the Stainland CC legacy in the next few years. There are also efforts to establish Stainland as a training ground for other youth teams which will contribute immensely whilst rejuvenating the recreation ground as a whole to make it into a training facility for all the sporting groups who currently use the site. In addition, considerations for the provision of a gym, changing and shower facilities as well as practice facilities such as cricket nets (both indoor and outdoor) indoor football/rugby/netball/basketball/golf/badminton facilities have also been suggested. The refurbishment of the tennis court and mini football pitch have also been mentioned as a possibility. What we are talking about here are the attempts of a local community to keep alive a hub that has provided a spirit and drive that has been in evidence for 130 years. We are all guilty of complaining that we are losing our community identity to all manner of influences, this is the chance to keep some of of it alive. Stainland And District Community Association have very kindly offered their support and added the discussion of these proposals to the agenda for their next meeting on Tuesday 13th May at 7.30pm St Andrew's Church, Stainland. Trish Wood and the people involved in this venture of trying to raise a phoenix from the ashes would love you to contact or join them and hear your views. If anyone wants to contact the group online then you can do it via this blog or the group's Facebook page at https://www.facebook.com/groups/1428414554084507/?fref=ts. So lets not let community cricket die a death that is becoming an all too common feature of British culture. There is much more to cricket than the opening Test match of the summer at Lord's or the IPL, you know.